Street legal electric scooters are not just a figment of someone's imagination. Electric motorized scooters are gaining in popularity and functionality. 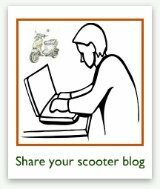 Would an electric motor scooter be right for you? If you're looking for an even greener alternative transportation than a gas scooter, you might look at electric scooters... no, not the kind your grandmother drives in the local box store! Today's electric motor scooters are more powerful and closer in functionality to gas-powered scooters than ever before. Electric power for scooters costs about 1/4 of what gas fuel would. 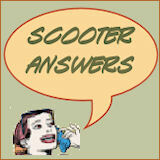 Electric scooters are quieter than gas ones. Electric scooters are more environmentally-friendly. It's more convenient and cheaper to replenish the "fuel." Just plug it in & recharge. 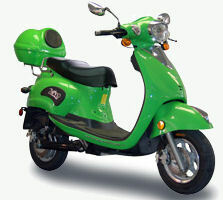 Electric scooters need less maintenance, such as no oil changes. Although electricity generation can produce some emissions, as a rule, they're less than those emitted by gasoline exhaust. Street legal electric scooters often cost a lot more than gas scooters. Electric scooters have to be re-fueled (recharged) more often than gas scooters, so they won't take you on as long trips. Electric motor scooters take longer to recharge than gas scooters do to fill up. 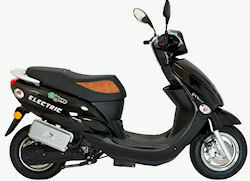 In many cases, electric scoots won't go as fast as their gas counterparts, though that is changing. 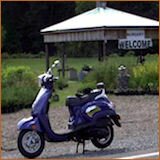 Electric scooter battery recharging can be inconvenient at times, depending on the accessibility of an electrical outlet to plug into. Electric scooters won't always keep going on cold days. 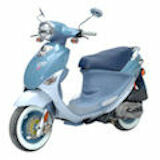 More are emerging all the time, as the idea of electric-powered street vehicles catches on. 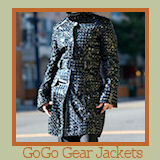 One website that seems to be staying on top of this emerging technology is EVFinder.com. They track electric cars too, including the electric smart car, which my husband writes about on his smart car website. 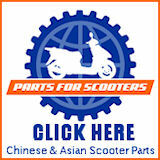 High-powered electric motorcycles are already available in the US. So, it is likely that street legal electric scooters that are the equivalent of many gasoline scooters won't be far behind. 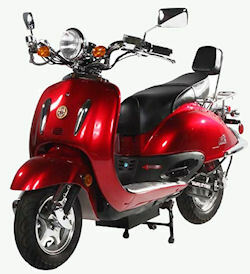 And if you're the type of person that wants to lower your carbon footprint in a big way, then an electric motor scooter just might be in your future!